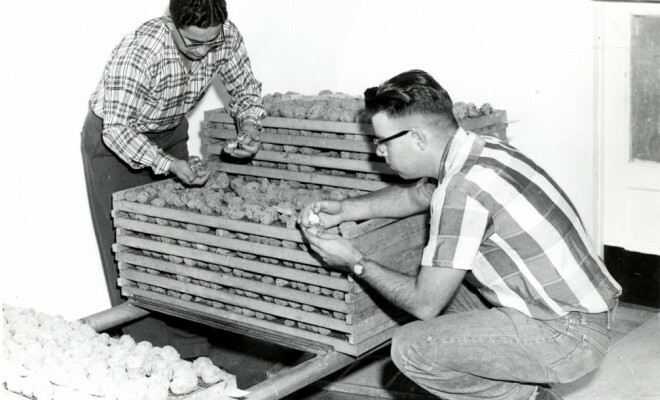 Albert “Peanuts” Merlino (left) worked at the Palisade Insectary from 1942 until 1986 when biological controls were developed for invasive insects, including Oriental Fruit Moth. In this 1950s photo, he and Jim Hampton examine trays of laboratory host potato tuber moth larvae. Each tray contains 100 female egg laying parasites, the Macrocentrus ancylivorus. The trays were moved to an incubator until the eggs hatched. The California-developed process required separating the tuber moth from the parasite cocoons. The release of the parasites was timed to attack the fruit moth larvae feeding on peach tree twigs and fruit. The parasite lays its eggs in young oriental fruit moth larvae. Once creating devastating problems for fruit growers, the Oriental Fruit Moth has been controlled in Palisade through the Insectary’s extraordinarily successful efforts.